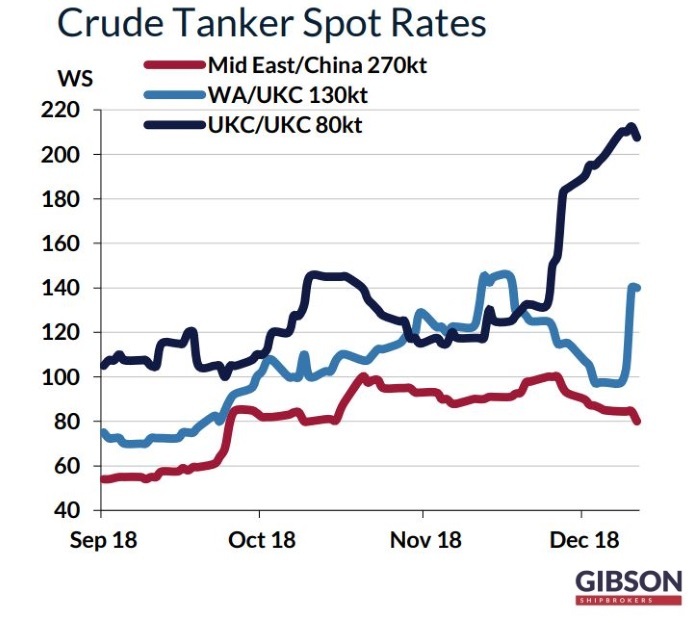 Tanker owners were faced with a mixed bag in the freight rate market, as there were highs, as well as lows throughout 2018, or as shipbroker Gibson commented in its latest weekly report, it has been a year of extremes. “For most part trading conditions have been very challenging amid a persistent oversupply of tonnage, with spot earnings often well below operating expenses. TCE returns for VLCCs trading on the benchmark TD3C voyage from the Middle East to China averaged just over $11,000/day during the 1st nine months of the year. However, since early autumn, notable increases in loadings out of the Middle East and strong demand from Asian refiners for Middle East and Atlantic Basin crudes have contributed to a very impressive rebound in earnings, with TD3C averaging in Q4 at over $50,000/day. Smaller crude tankers were quick to follow suit, supported by the jump in VLCC rates, a rebound in Nigerian crude production and higher Libyan crude exports, while weather disruptions in the Mediterranean and escalating delays in Bosporus also played an important role. Throughout the year, we have also seen relentless growth in US crude exports, offering incremental support to all crude tanker categories. US seaborne crude exports averaged just over 2.2 million b/d last November, up by nearly 1 million b/d versus the corresponding period in 2017”, Gibson said. According to the shipbroker, “December has also seen a major hike in clean tanker earnings against a backdrop of largely very weak results during the rest of the year. Overall, the growth in the product tanker trade in 2018 has been rather mediocre; yet, recently the market has been helped by higher US product exports, a rush of east-west cargoes and less willingness on behalf of newbuild crude tankers to compete for product cargoes on their maiden voyage. In addition, some LR2s were tempted into switching to dirty trade, another factor which helped to somewhat tighten tonnage availability”. Gibson added that “2018 has marked the highest number of tanker demolitions over the past fifteen years. All in all, over 150 tankers above 25,000 dwt have been sent to the recycling yards, with weak industry returns and attractive scrap prices offering a strong impetus to scrap. 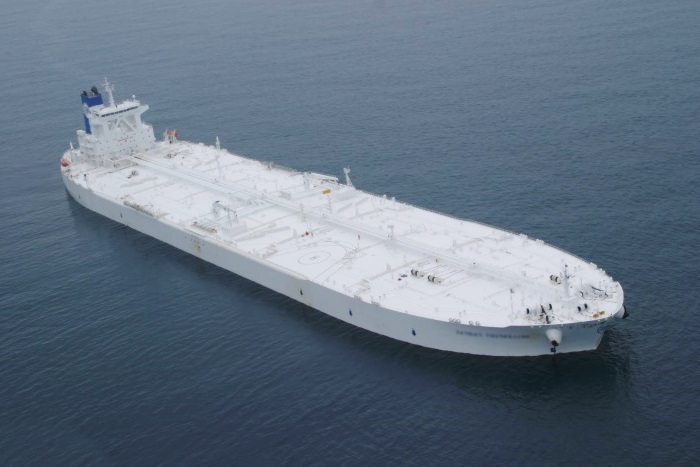 At the same time, the market has seen lower than expected number of new additions: over 25% of the tanker orderbook scheduled for delivery in 2018 has slipped into next year. The combination of robust demolition activity and a slower pace of tanker deliveries has meant that the growth in tanker supply has been fairly marginal”. “Another consequence of the dire market conditions for most of the year has been a welcome decline in new tanker ordering activity. Overall, investment in new tonnage has fallen to one of its lowest levels seen over the past decade. Only VLCCs bucked this trend, with new tanker ordering largely driven by speculative investment, with a focus on scrubber equipped tonnage. 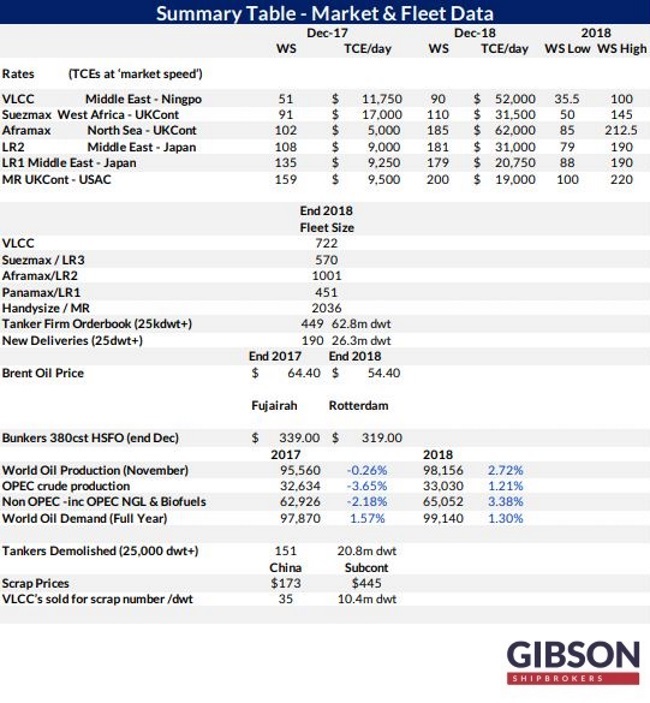 Nonetheless, even VLCCs have seen notable slowdown in ordering activity in the 2nd half of the year, with just 3 tankers ordered versus 34 between January and June”, Gibson said. The shipbroker also noted that “another key development of the year has been the uptake of the exhaust gas cleaning technology. At the end of 2017 hardly anyone showed any support for the technology. The picture is very different now, with more and more owners committing to installations on newbuild and secondhand tonnage over the course of 2019/2020. The biggest interest in scrubbers is in the VLCC segment. If we count all the units where the technology is fitted, will be fitted or intended to be fitted, by the end of 2020 scrubber equipped VLCCs could reach over 20% of the current fleet on water”. “As we head into 2019, there will be new challenges and new opportunities. The most immediate threat to demand is the pending OPEC production cut. There is also a substantial new tanker delivery profile over the course of next year. We will hope to see a similar slippage in 2019 delivery dates as the one witnessed this year; however, there could to be less willingness to do so, particularly for scrubber equipped tonnage. On the upside, the expectations are for further increases in long haul trade out of the Americas and higher trading demand in preparation for the IMO2020. Taking account of all the factors above, could we be heading for another rollercoaster ride again next year?”, Gibson concluded.